Members of the AFC Bournemouth under-18 squad celebrated World Book Day with pupils from Elm Academy. The players read to the youngsters and took part in a question-and-answer session at the academy which is on Holloway Avenue in Bournemouth. World Book Day is a registered charity and aims to give every child and young person a book of their own. It is also a celebration of authors, illustrators, books and reading and is marked in more than 100 countries all over the world. AFC Bournemouth head of education and player care Dawn Roach said: “We were delighted to be given an opportunity to visit Elm Academy to support their World Book Day celebrations and hope their pupils enjoyed it as much as the players. “We split the players across all year groups and they took part in various activities, such as reading to the pupils, answering questions and showing off their footballing skills. 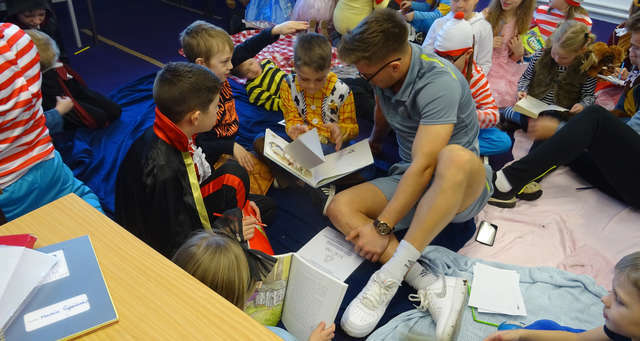 “It’s important children of all ages come together to appreciate reading and World Book Day is an excellent initiative which we, as a football club, are very pleased to get behind and help promote.